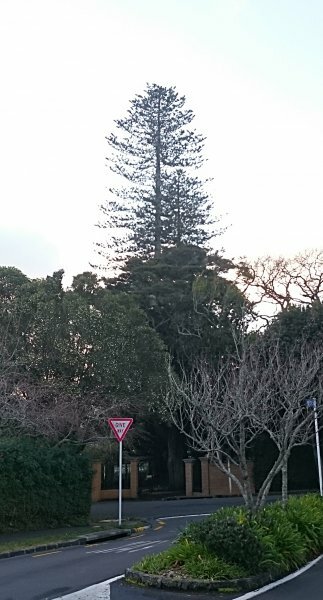 This impressive Norfolk Island pine is currently the tallest known tree in urban Auckland, the second tallest of its species in New Zealand, and currently the second tallest known Norfolk Island pine in the world. An obviously tall tree, visible around northern Epsom and across from Mt Eden, a preliminary estimate of height was made using Google Earth LIDAR ("Laser radar") data. This indicated a height of between 50-52 m above the ground. Ground-based laser measurements gave a height of 52.1 m, using an adjacent path as a reference point between the slightly lower base of the tree and the highest top. This height was confirmed with a separate measurement taken with another instrument at a later date. 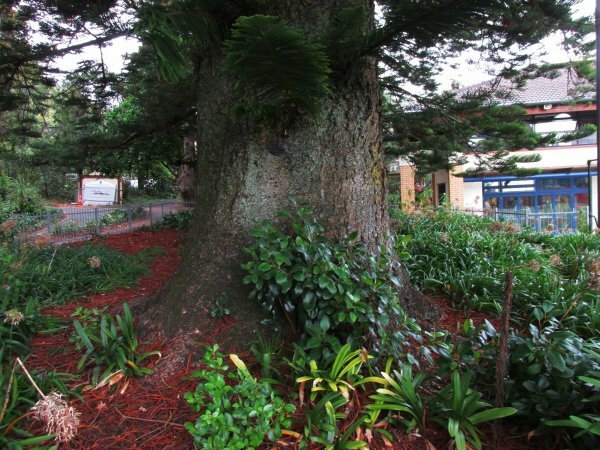 The tree, and the smaller Norfolk Island pine next to it, are likely to share the same history as the large Queensland kauri on the same property (see AR/0736) and the neighbouring Dilworth School (AR/0735). The tree is on the Auckland schedule of Notable Trees, but at the time of writing, an application has been made to remove the two Norfolk Island pines and the Queensland kauri from that schedule. A Norfolk Island pine at Tedeschi Winery on Maui, Hawaii was measured at 51.8 m in 2003. Unless that tree has grown further, this tree is the tallest known tree of the species. 1. The Gymnosperm Database Araucaria heterophylla, Retrieved July 22 2015. 51.8 m measured between top and reference path. Mid-slope of tree base is 0.3 m below path. In apparent good health, with a intact top. It has been reported that a limb retention system and pruning has been carried out on the tree. 21 May 2015 Cadwallader, B.G. & Smillie, M.J.
Near the Mt St John Ave. entrance to the school.